Root Canal treatment is necessary when the tooth gets decayed or infected badly or when a cavity develops. This damages the root of the particular tooth. 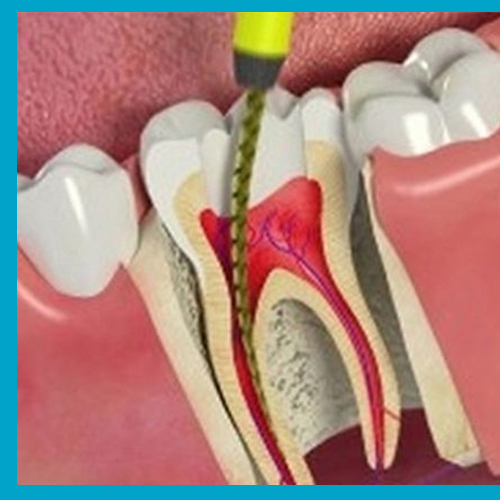 Root Canal is the centre part of the tooth where the natural cavity is present. There is a softer part inside the root canal known as the dental pulp. If this pulp gets infected or inflamed, then a root canal treatment is mandatory. This is because there is a high risk of the infection to spread. The pulp breaks and infection starts to spread until the end of the root. This can lead to severe swelling and other dangerous outcomes. So, opting for a root canal is essential. The major causes for infection are chipped or cracked tooth, injury on the tooth, a deep filling or cavity, deep decay and frequent dental procedures. During a Root Canal treatment, a tiny slit is made in the tooth to remove the pulp. The outer surface of the tooth remains in the same place without any alterations. Then the pulp is carefully removed and the root is filled with a material. A crown for the tooth is placed for preventing it from discoloration. This also keeps the tooth safe and protected post-treatment. It is recommended that this treatment is done with experienced dentists. X-Ray: A clear X-ray of the affected tooth is taken and analyzed. Anesthesia: The anesthesia is given near the tooth that needs treatment. This makes the entire place near the tooth alone anaesthetized. Pulpectomy: Removal of the dental pulp. Filling: The filling and sealing of root with a rubber-like material. Crowning: The treated tooth is fixed with a crown that acts as an outer covering. The process may vary according to the requirement of each person.